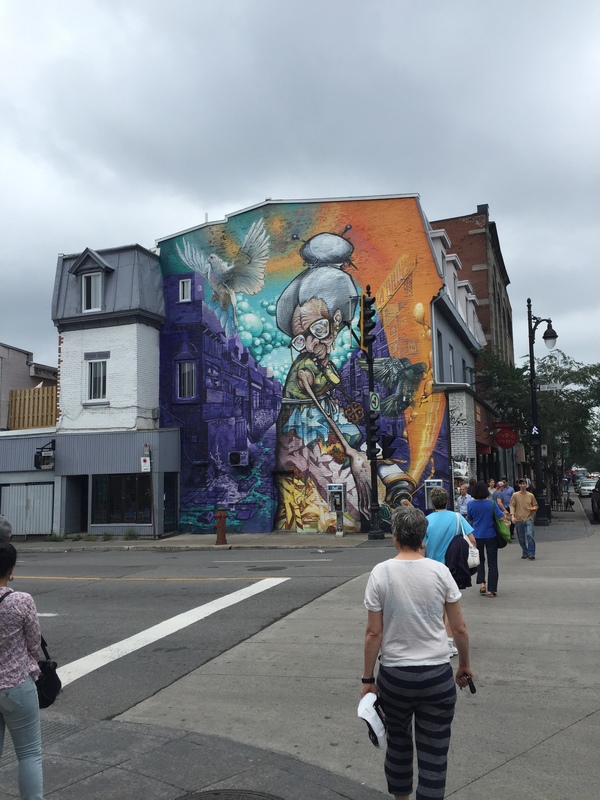 I had the privilege of taking a ten day trip to Montreal and Quebec City last week that changed my perspective on urban life and urban streetscapes. 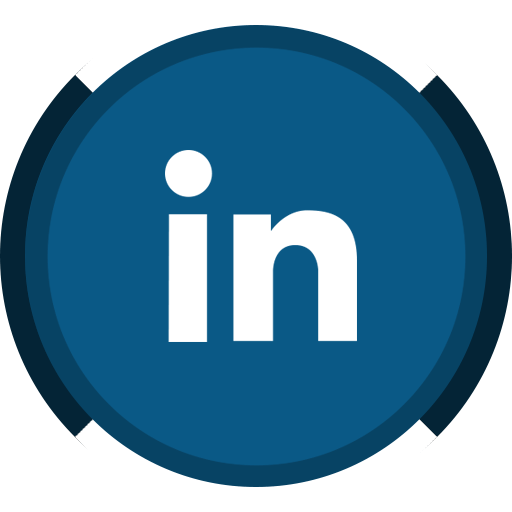 Below are some scattered thoughts on how downtown San Jose can learn from the successes of Montreal and Quebec City. 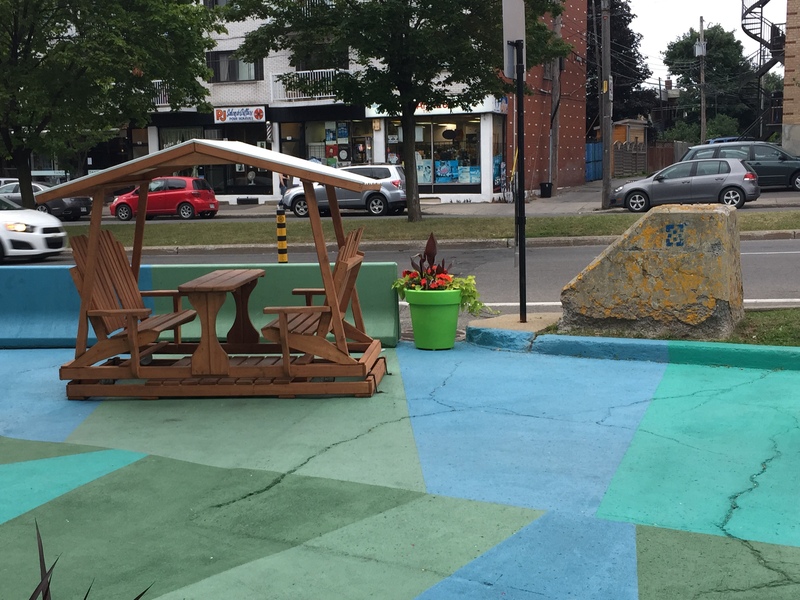 When an urban streetscape is unexpected, exciting, and interesting… it’s joyful. This building in Quebec City was intentionally built to mimic the surrounding historic French style buildings. 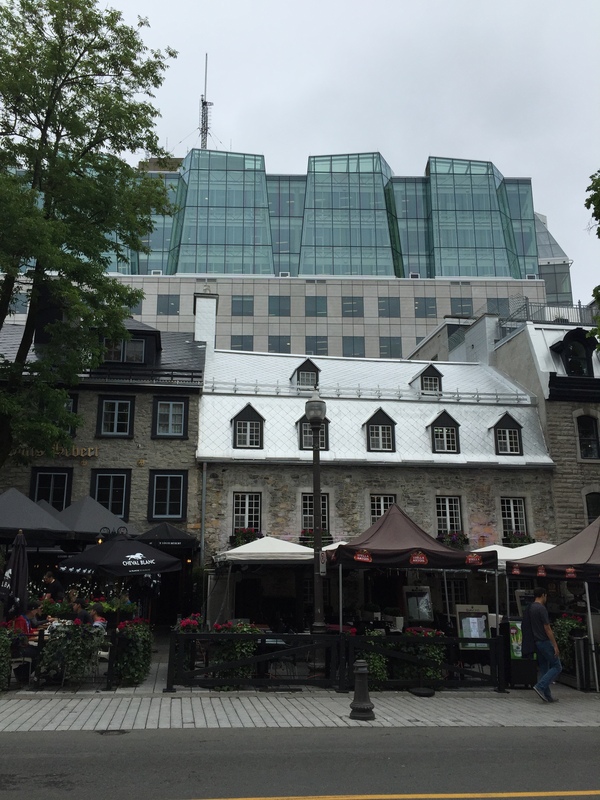 Even though it uses modern glass, which starkly contrasts the stone of the neighboring historic buildings, it fits well in the cityscape, and adds an element of intrigue at the top, with a green roof… yes a green roof in Canada(more on that later). 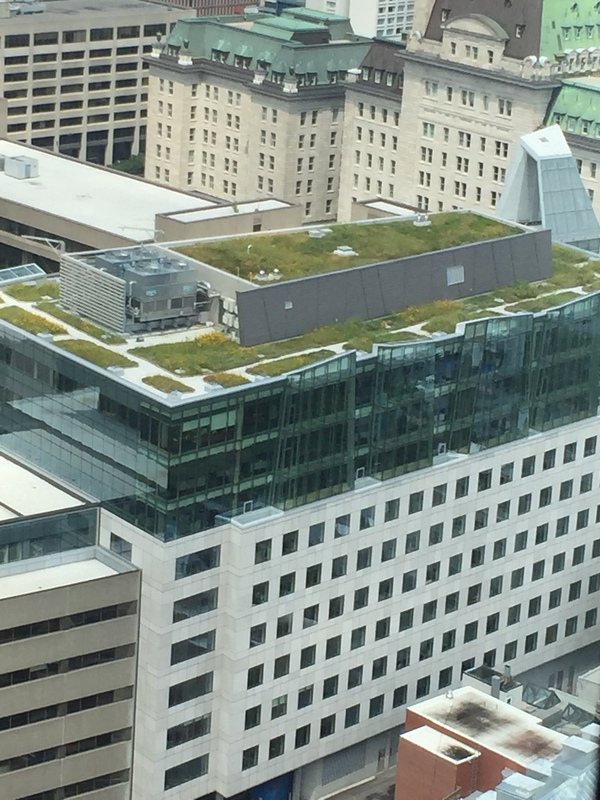 Same new building with green roof, Quebec City. This condo/apartment building in Quebec City was my favorite modern architectural building, on the whole trip. I particularly enjoyed the larged curved balconies, the transition of the brick to modern finishes at the top, and the large green roof, with several rooftop terraces(2nd green roof). The story of the project is eerily similar to Barry Swenson’s Parkview towers. The historic church had to be renovated as a requirement of the project. So the developer took it apart and re-assembled it brick by brick. The former church is now used as communal space, as well as a neighborhood community center. I think this design would have been a great addition to St. James Square. New apartment building with big balconies, Quebec City. New apartment building built around a refurbished church as part of the development, green roof, Quebec City. 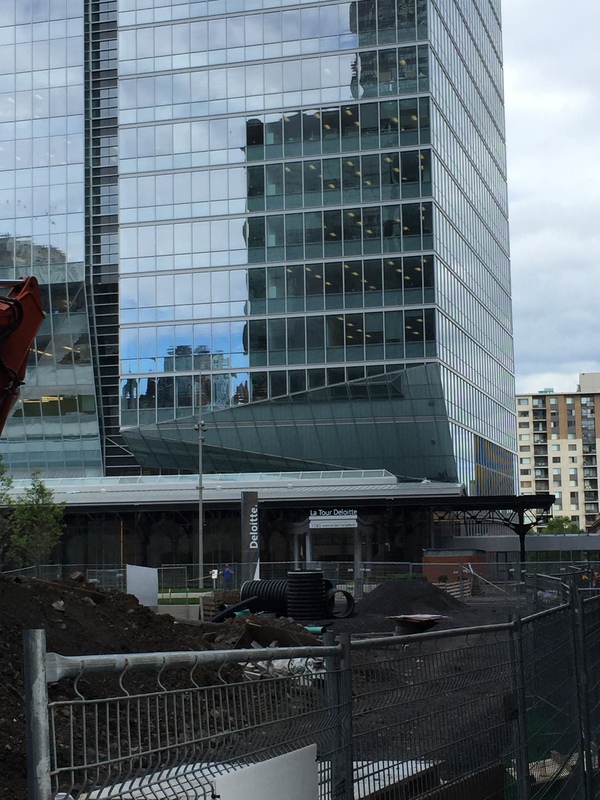 This new office building has a great cut-in as it approaches the ground floor. 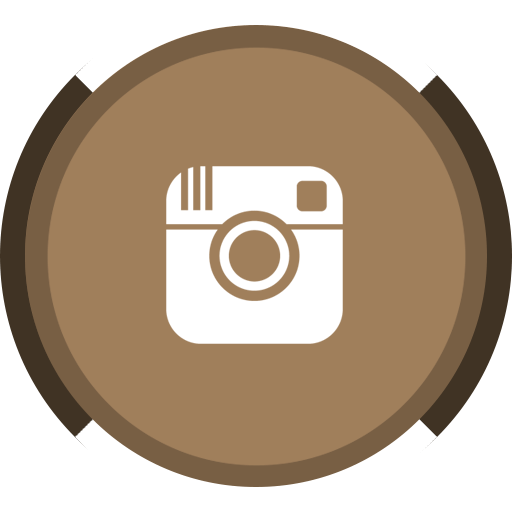 I also like how the design doesn’t end with a square top, but rather on an angle. It’s refreshing to know that not all buildings need to be finished as a square, including mid-rise… looking at you San Jose. New office building, tapered glass wall near ground floor, Montreal. 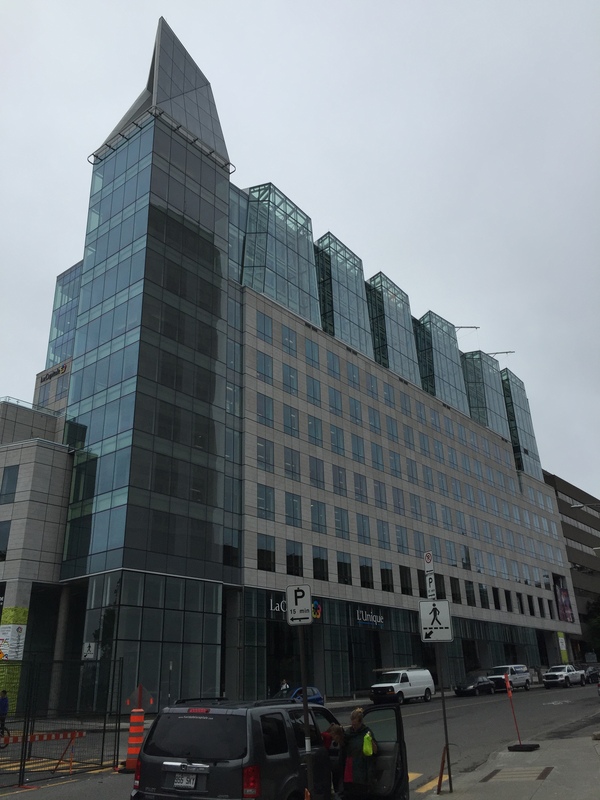 New office building, tapered glass wall near ground floor, angled roof, Montreal. 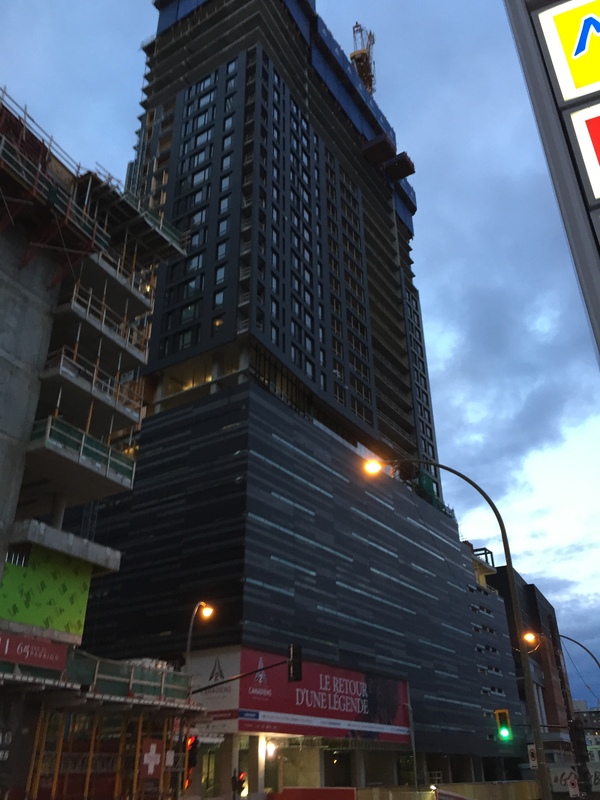 This new condo tower under construction in downtown Montreal, uses an interesting horizontally striped pattern from the ground floor to the podium level. Then the slim tower changes to a window grid system. New condo building under construction, Montreal. 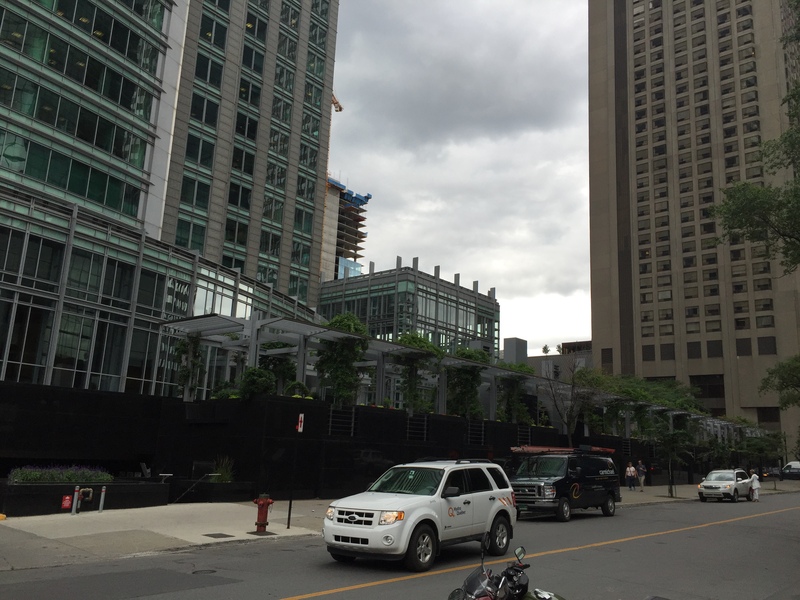 Another condo tower under construction in downtown Montreal. Sleek glass walls, with balcony cut outs. My best shot of the Montreal skyline. The clouds are pretty typical throughout summer. 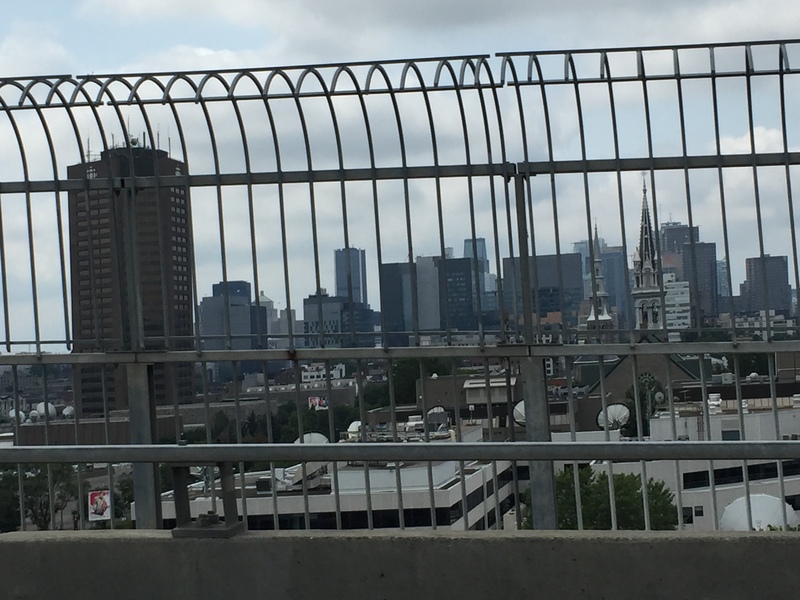 Montreal skyline from Jacques-Cartier Bridge. This office building has a nice terraced plaza. But even with a secluded walled area, the vined overhangs protect pedestrians on the street from sun and rain. Well designed, and adds intrigue to the streetscape. Walled plaza with vines at the base of commercial building, Montreal. These are the Olympic Apartments built for the 1976 Summer games for athlete housing. They were converted to apartments after the Olympics. Most the units have huge balconies, and those renters who were lucky enough to get in early, have got a great deal today. The rent is extremely low, due to Montreal’s rent control. The Olympic Village Apartments, built for 1976 Olympic Village, re-purposed as apartments, Montreal. 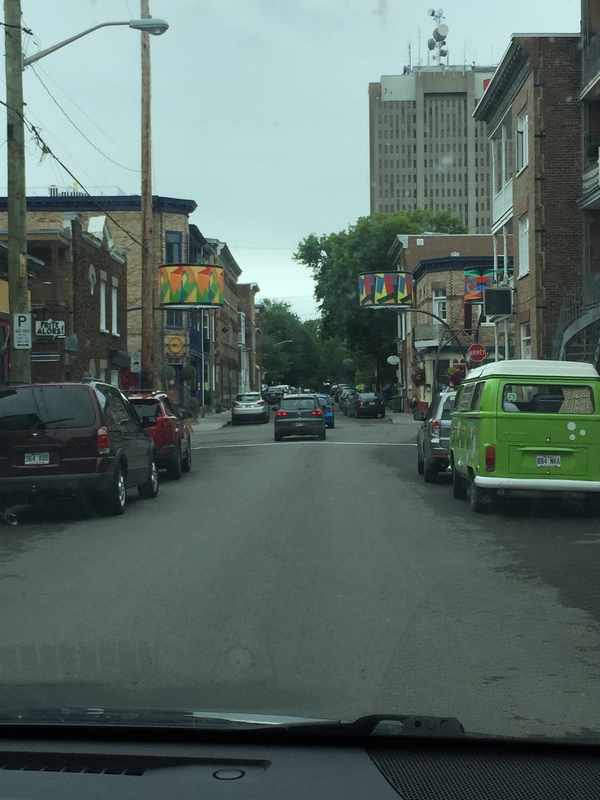 This is a typical street in Montreal. Three story brick apartments lined most of neighborhood streets. Outdoor staircases lead to 2nd and 3rd floors, unusual when you consider that it snows here for 4-6 months of the year. Typical 3 story brick apartment architecture in Montreal. 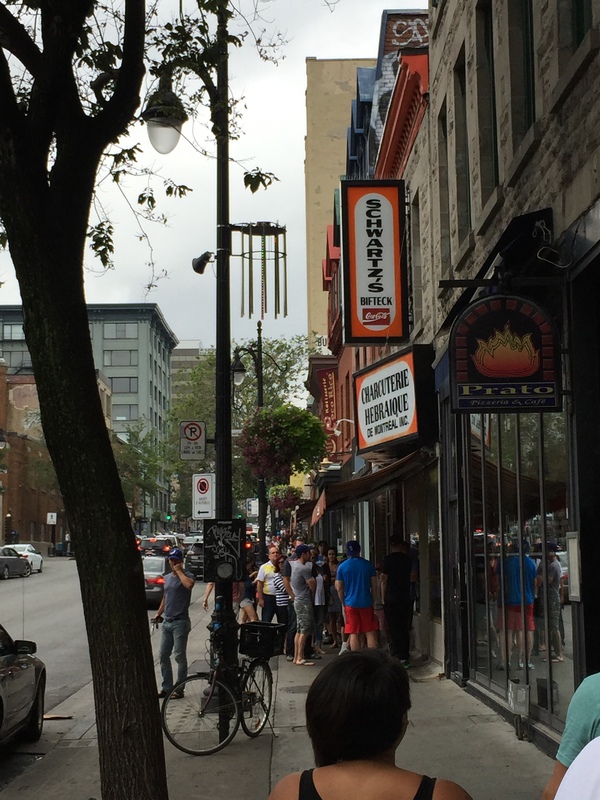 St. Laurent Street with line in front of legendary Schwartz smoked meat, Montreal. Unfortunately, I didn’t take sufficient pictures of the bikes in Montreal. Needless to say, cycle tracks and bikes are parked everywhere. Bikes are the preferred method of transportation around most of the neighborhoods. When people are not biking, most walk or use public transportation(metro/buses). 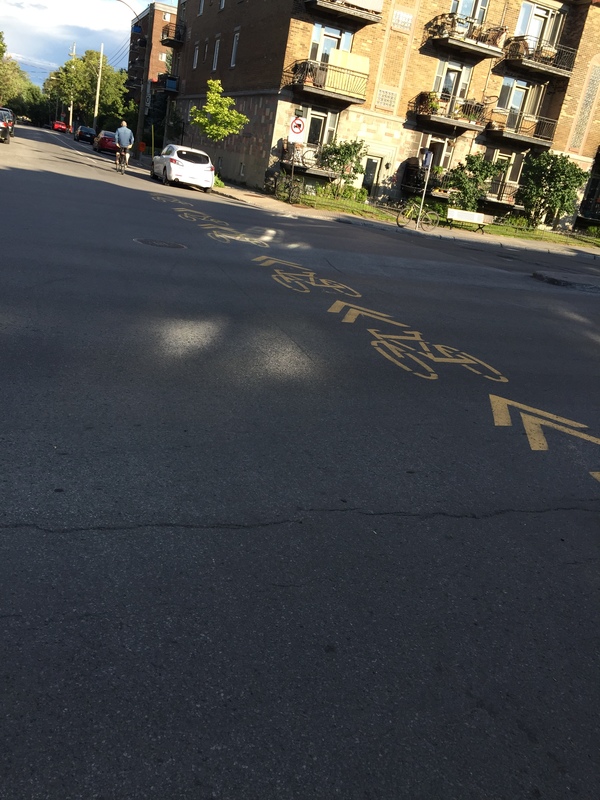 Protected bike lanes(cycle tracks), Montreal. Even bike parking can be interesting and colorful. 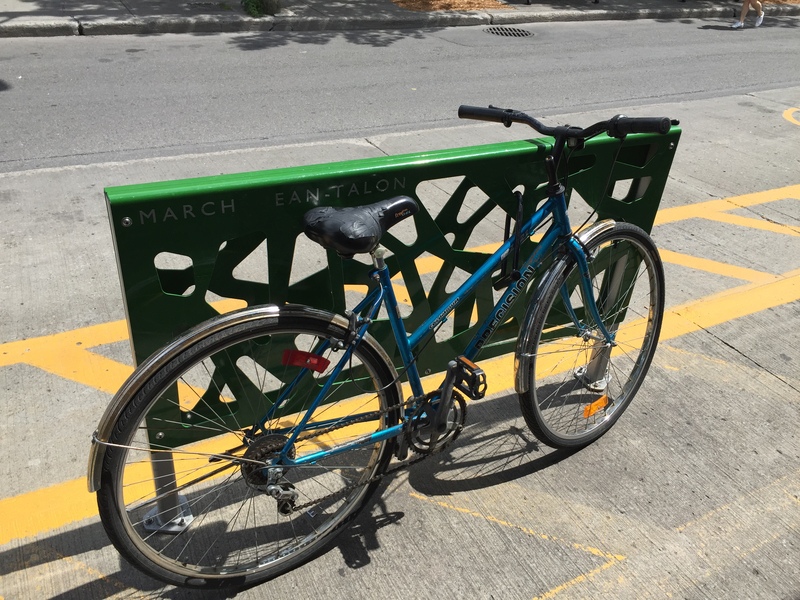 Art piece that doubles as a bike rack, Montreal. This major street has a crossbike(?) for bicycle crossing. These lampshade street lights add color to the intimate streetscape. They were added to create a sense of place in an up and coming neighborhood in Quebec City. Bright lamp shades on outdoor streetlights, Quebec City. 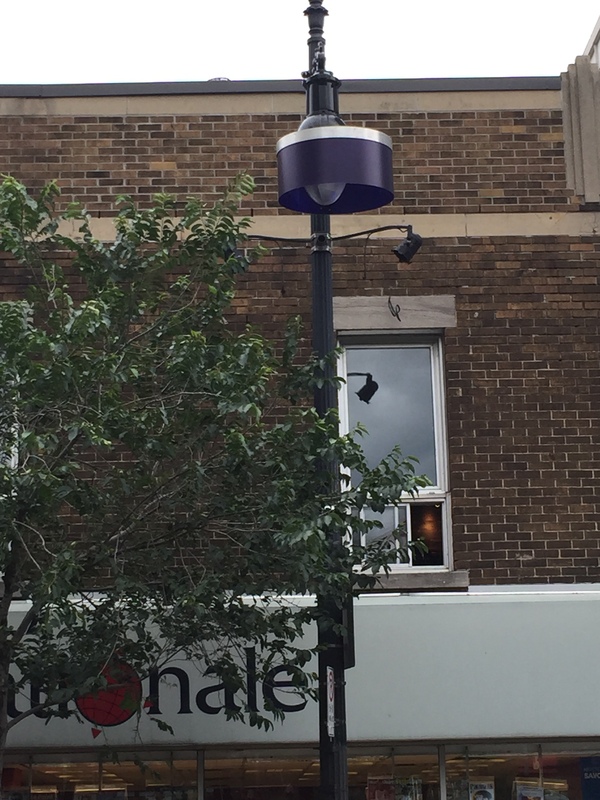 Purple plastic wrapped around existing street light. A simple and effective way of creating color in the day and colorful light at night. 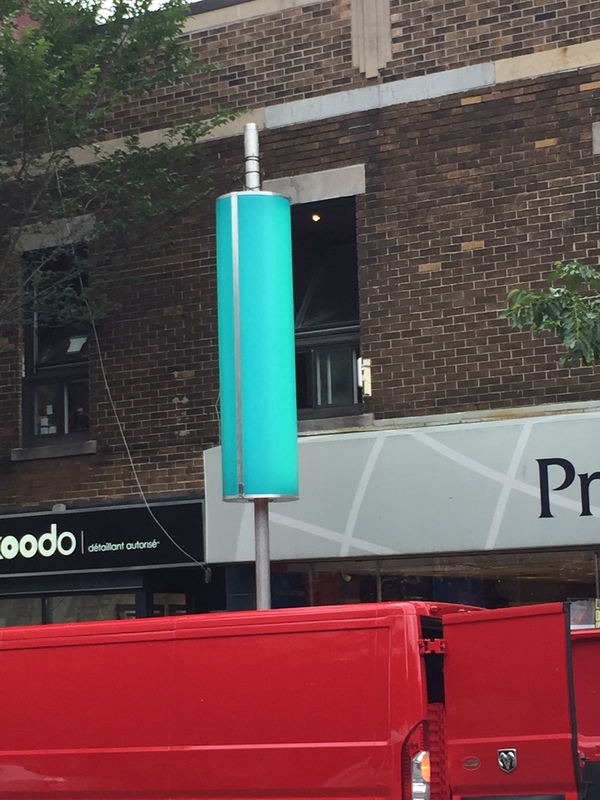 Simple colored plastic wrapped around streetlight, Montreal. 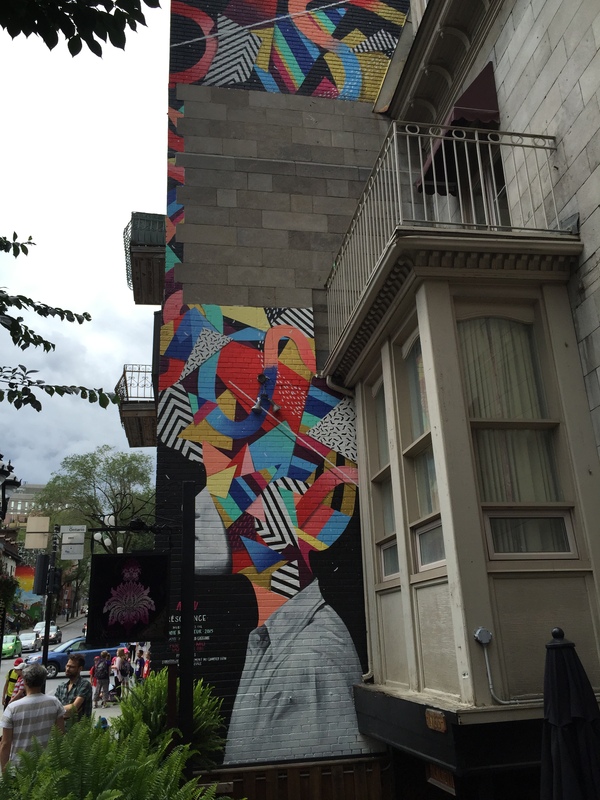 Murals are everywhere in Montreal. 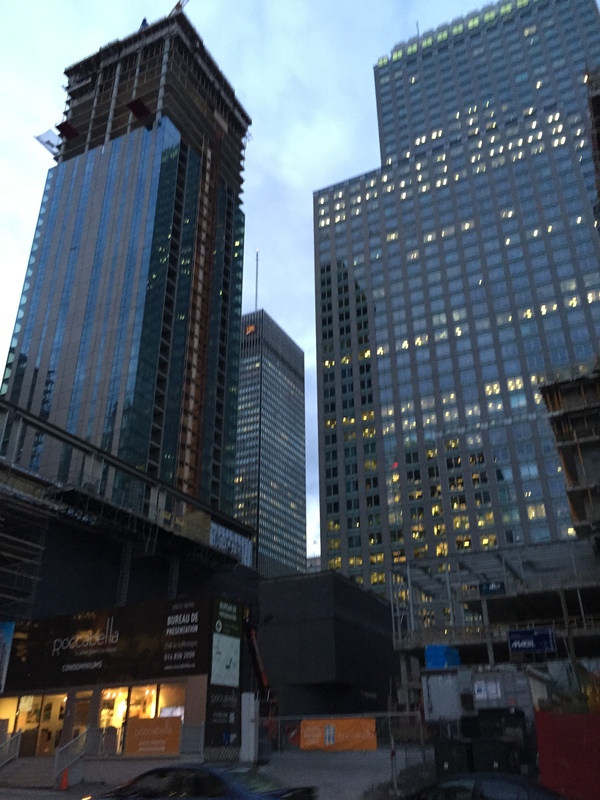 Old buildings, new buildings, residential, and commercial. Finding murals in back alleys, and main streets was exciting and fun. 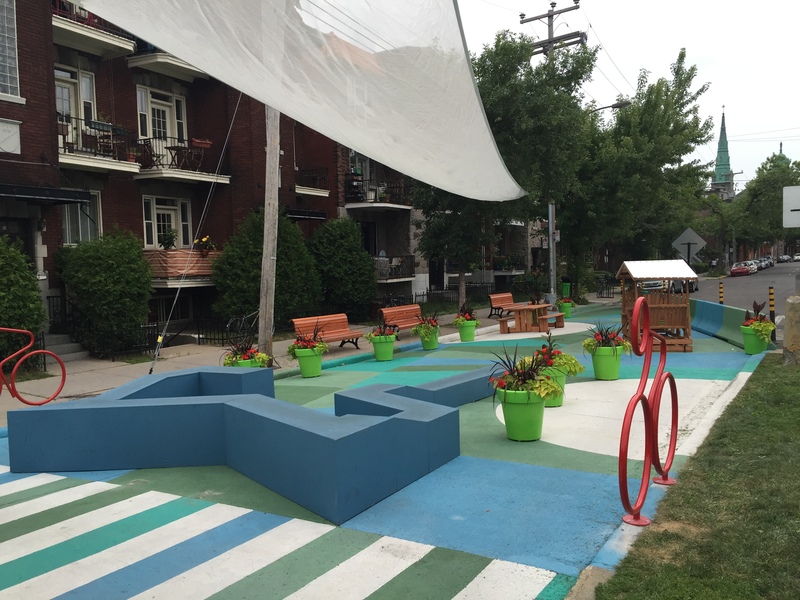 They added color and culture, helping shape each neighborhood’s identity. You don’t need much space to put in a mural. 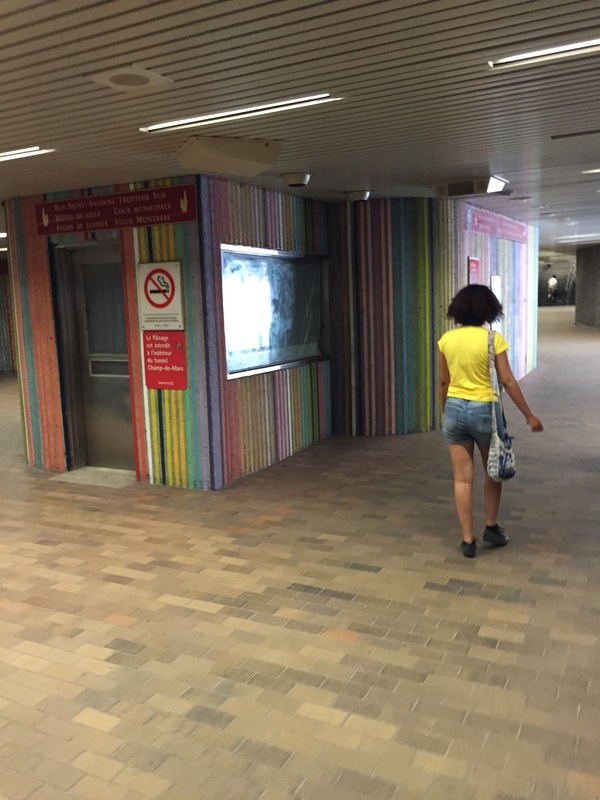 Even public buildings(metro stop) and walking tunnels were painted to contrast the cement materials used in construction. 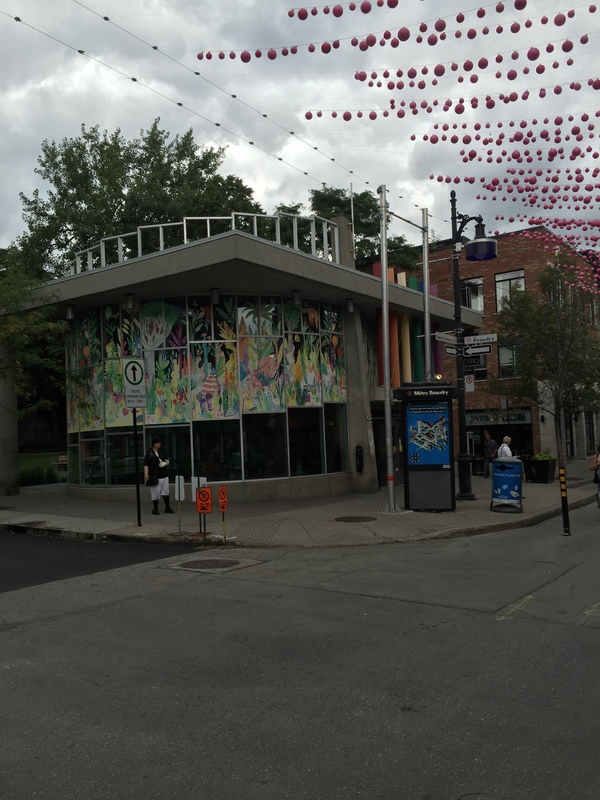 Colorful metro station in gay district, Montreal. 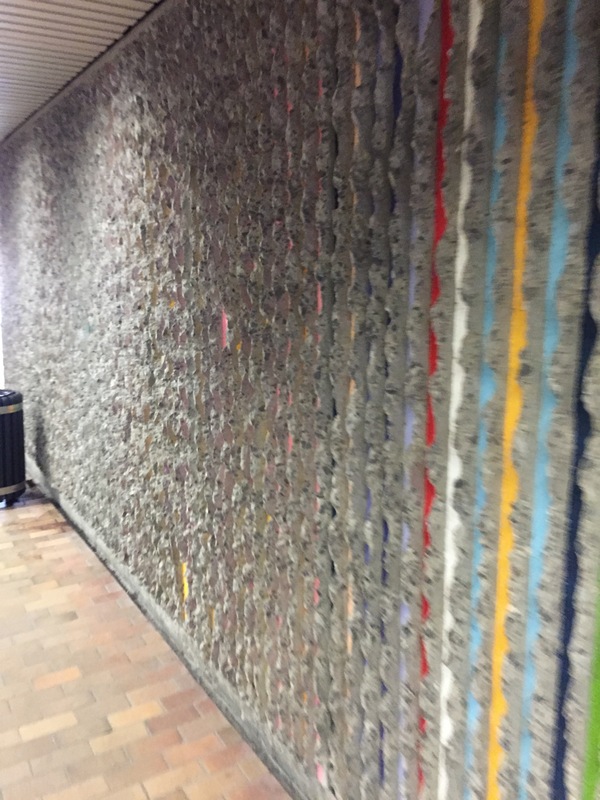 Painted cement in underground walkway, Montreal. While walking in the gay district, I found that during the summer, the district installs plastic pink Christmas ornaments across the street for about 10 or so blocks. The effect is amazing. While I was there, a public art festival was just finishing up its second week. This street is closed to vehicular traffic for 4 months as part of the summer season. Pink Christmas ornaments strung up over 10 city blocks in the gay district for the summer. 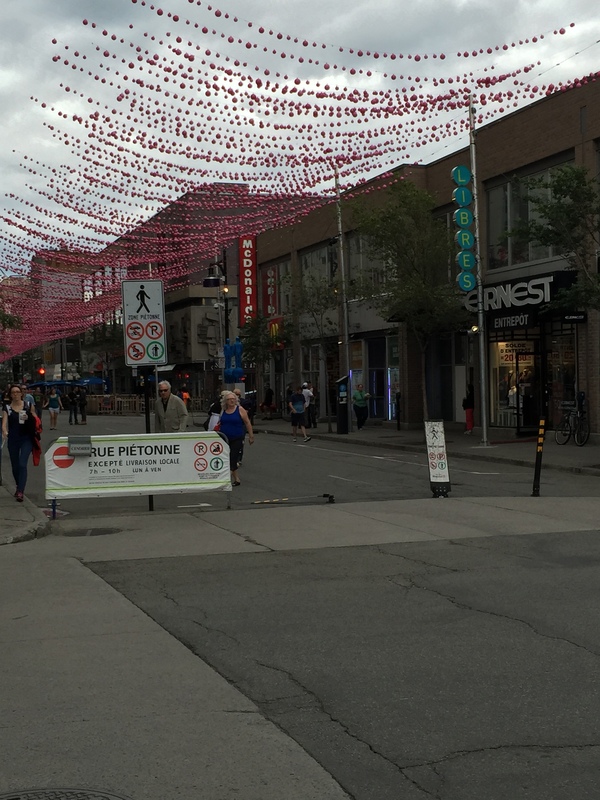 Street closed to vehicles for 4 months for an art festival, Montreal. 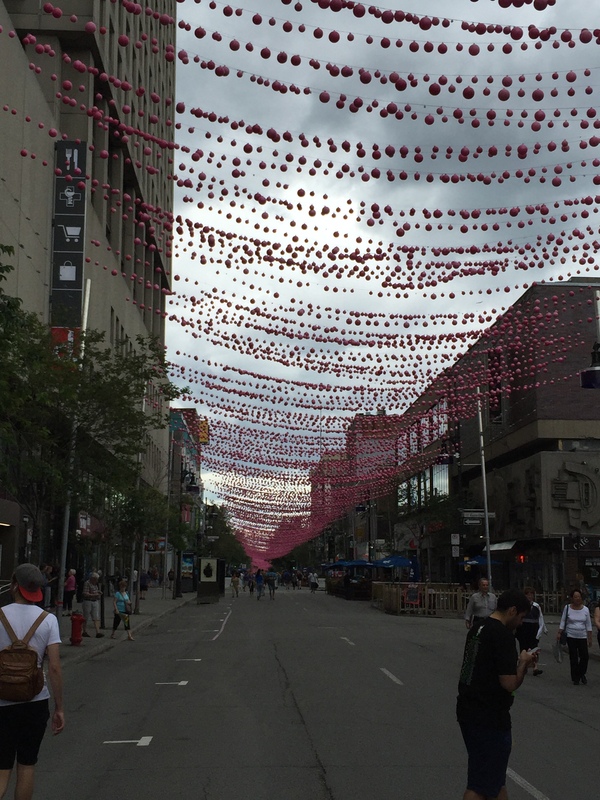 Pink Christmas ornaments strung up over 10 city blocks in the gay district for the summer, Montreal. 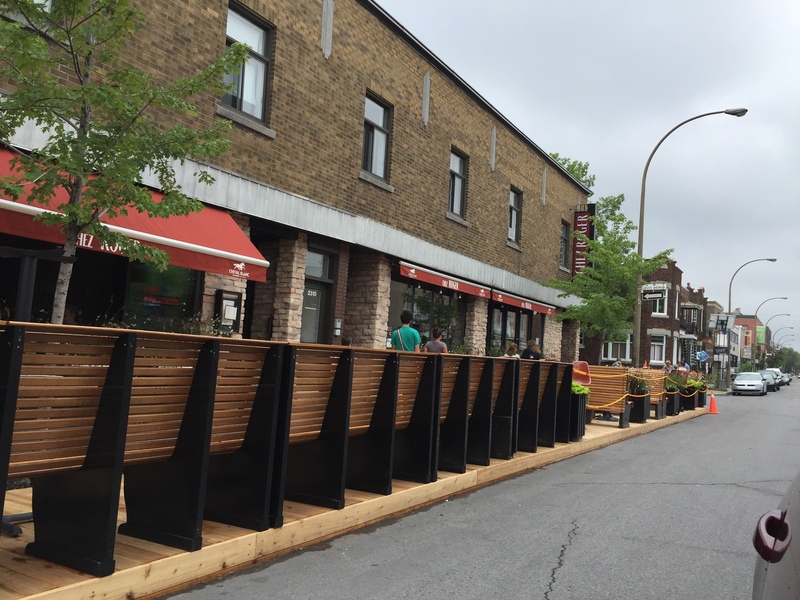 Again, I didn’t take enough pictures, but there were several(3 that I saw) parklet corridors in Montreal. These stretched from 5-10 blocks each, where each restaurant/bar had an outdoor eating and drinking area connected to the business. The variety of designs was inspiring. This sculpture was part of the public art street exhibition in the gay district. This colorful alley entrance was in the oldest part of Quebec City. It added much needed color to the grey stone walls and street. 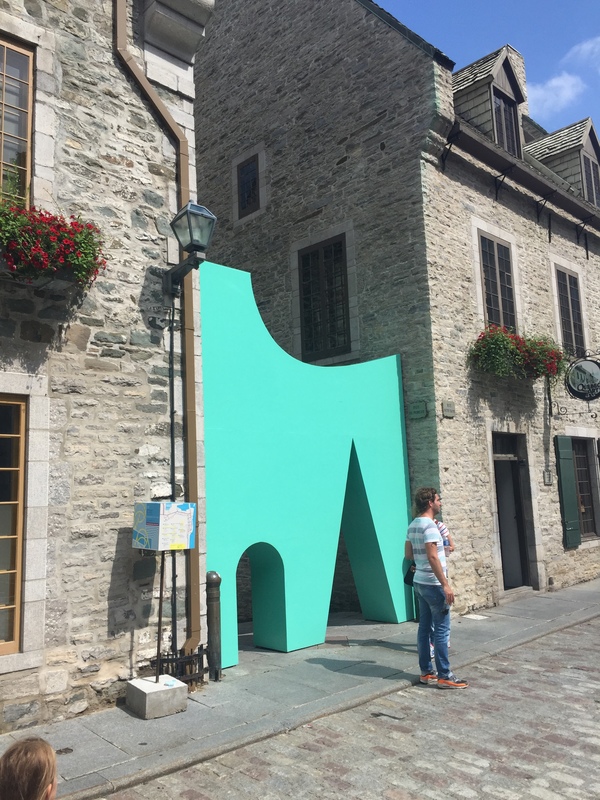 I found it interesting to see a modern art piece juxtaposed to the 1600’s architecture. Colorful art entrance to ally, Quebec City. Colorful art entrance to alley, Quebec City. 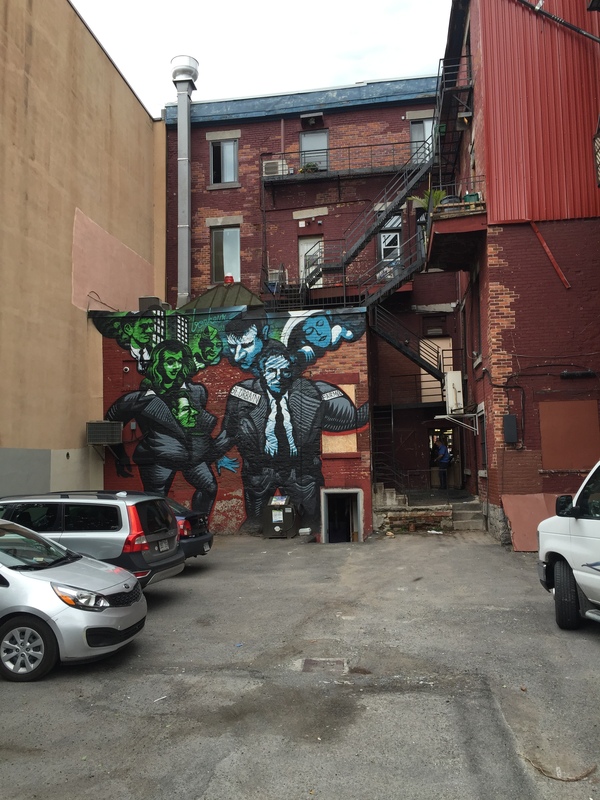 The alley beyond the entrance, Quebec City. 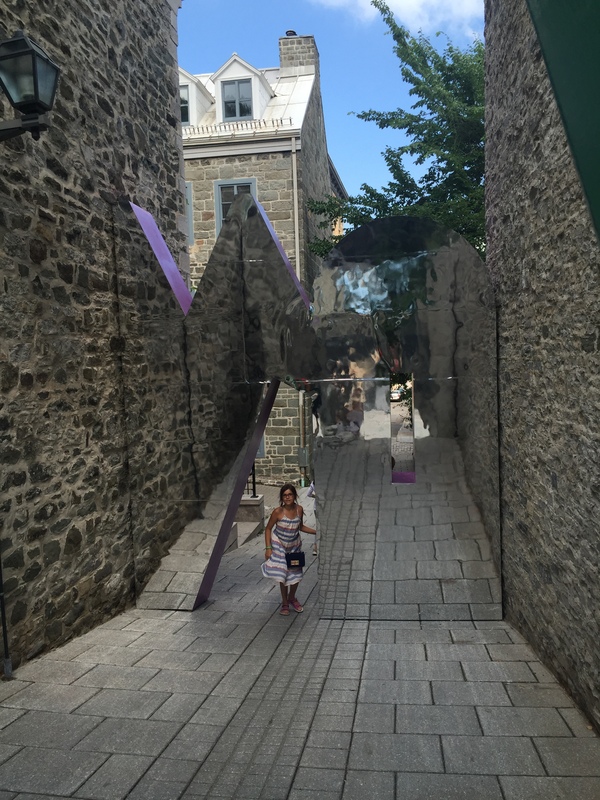 Beyond the entrance, the alley has a mirrored wall with an opening to continue down the alley. 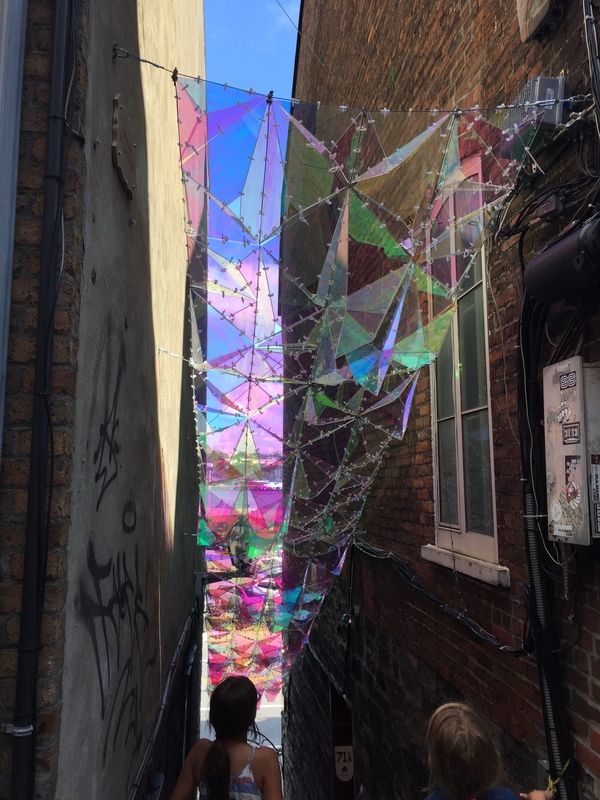 One of the best art pieces I saw, was this iridescent plastic and zip tied piece strung over an alley. So simple, so beautiful. 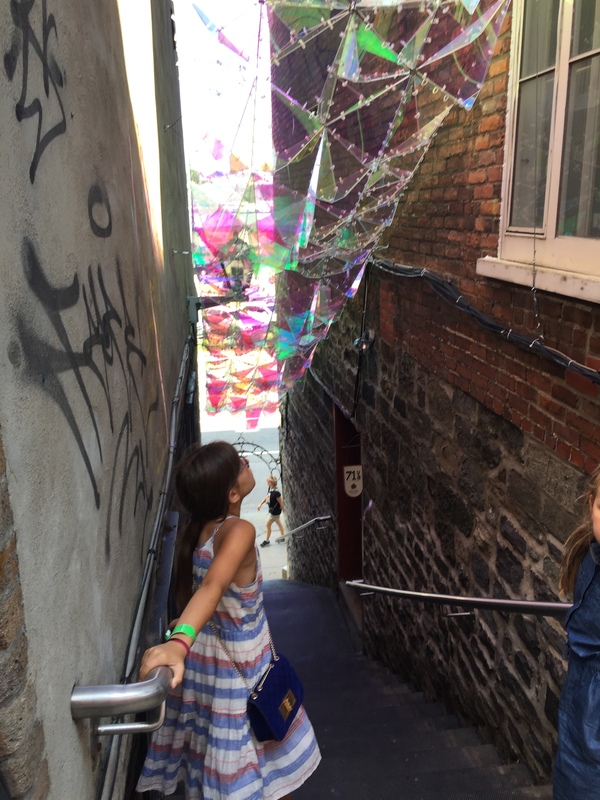 Iridescent plastic zip tied together over a staircase, Quebec City. Even the public buildings had art. 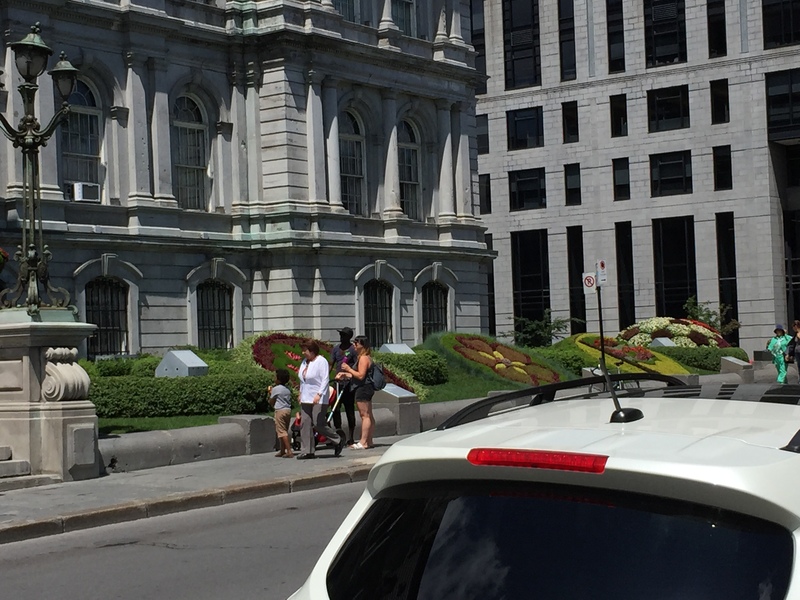 Here is the Montreal City Hall, with flower art. These pieces are different every summer, and tourists come from all over just to see them each year. Flower art in front of city hall, Montreal. Artist working on flower art in front of city hall, Montreal. Shipping containers are not just for retail. Here is a group of shipping containers set up as a haunted house of horrors. This is a long line of shipping containers(25?) along a paseo in the Old Port of Montreal. Everything from Christmas ornaments, to clothing is available for tourists to purchase here. 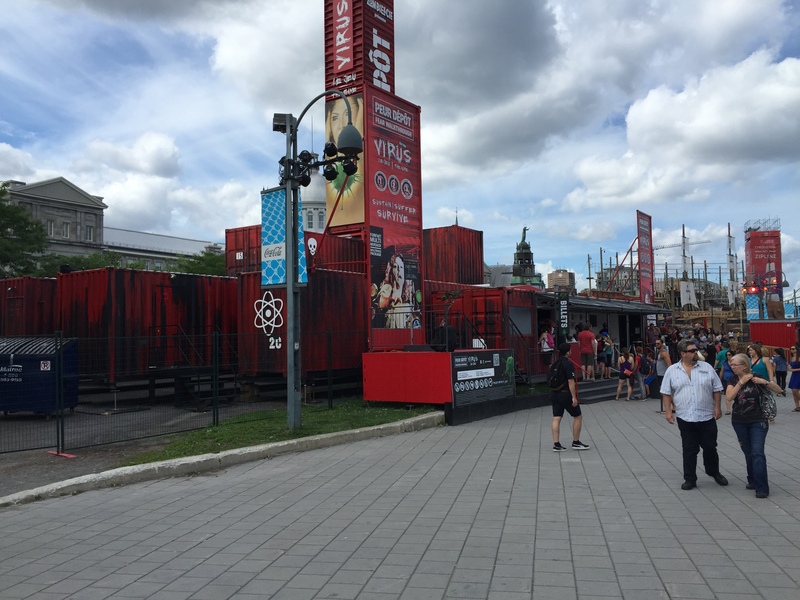 Retail shipping containers lined along a pedestrian corridor, Old Port, Montreal. This was a VIP area for a concert at the Music Festival of Quebec City. 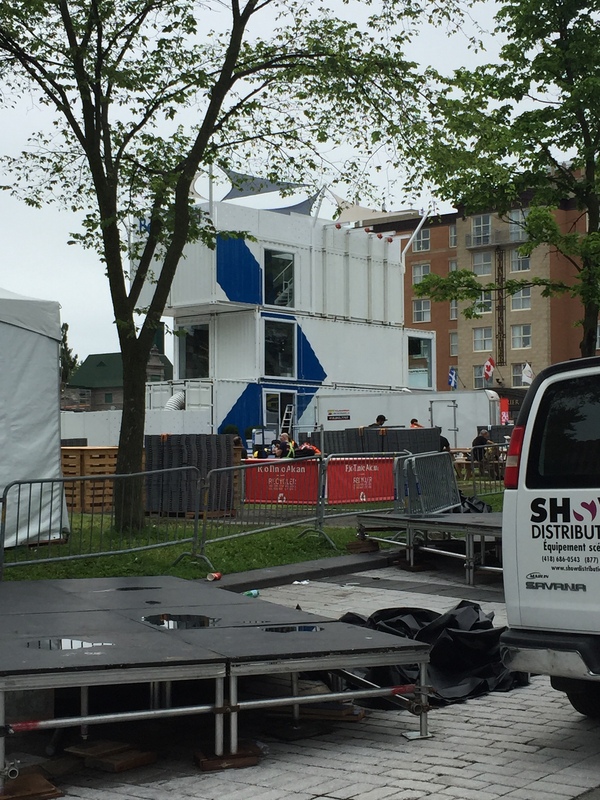 Storage containers used as a VIP area for the music Festival of Quebec City. The park below was created from a right turn lane at an intersection. It has a swing, bike share station, and bike sculptures for bike racks. The cement is painted different colors, and a shade structure was installed. This is a semi-permanent pop-up park. This is in a typical residential neighborhood. 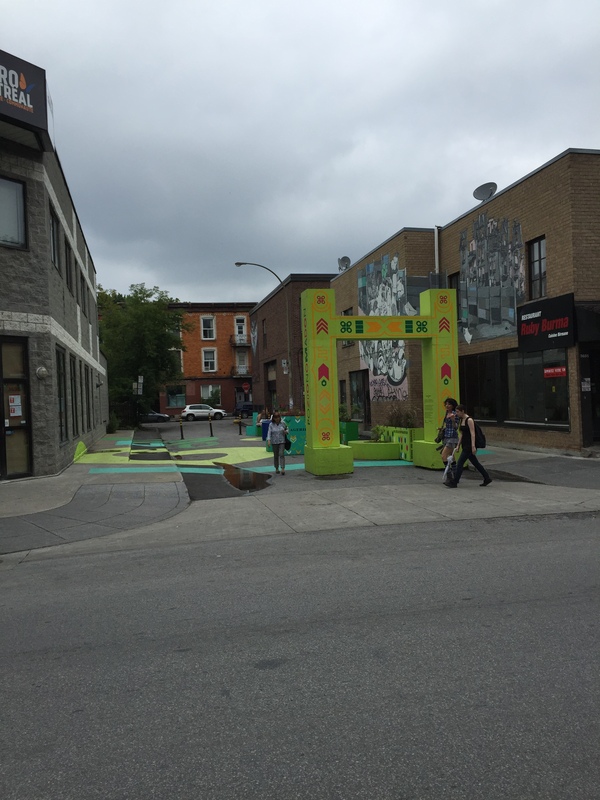 Closed section of street, now a pop-up park, Montreal. 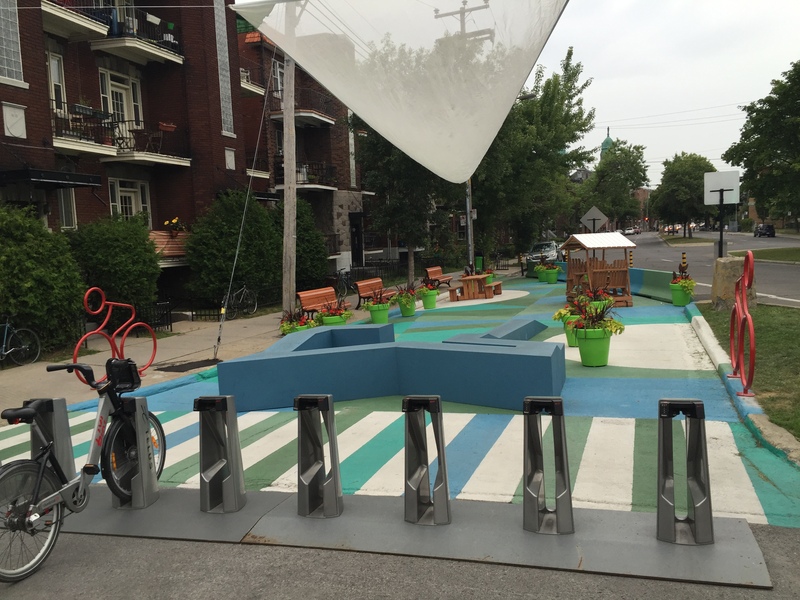 Bikeshare station at pop-up park, Montreal. Swing at pop-up park, Montreal. This side street was closed off to cars directly off a main street. Colorful, with places to sit, and an arch added for character. 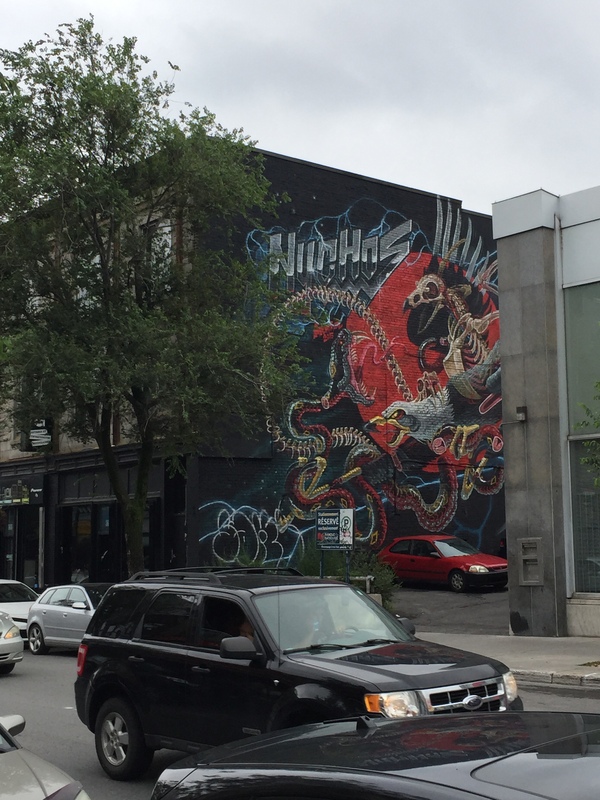 Closed side street with colorful art, Montreal. Horse drawn carriage, old Quebec City. 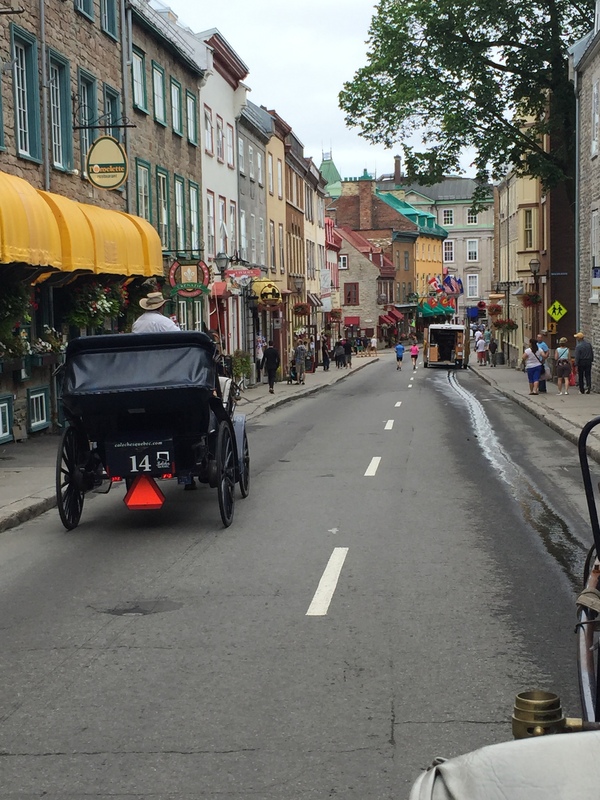 Horse drawn carriage ride, old Quebec City. 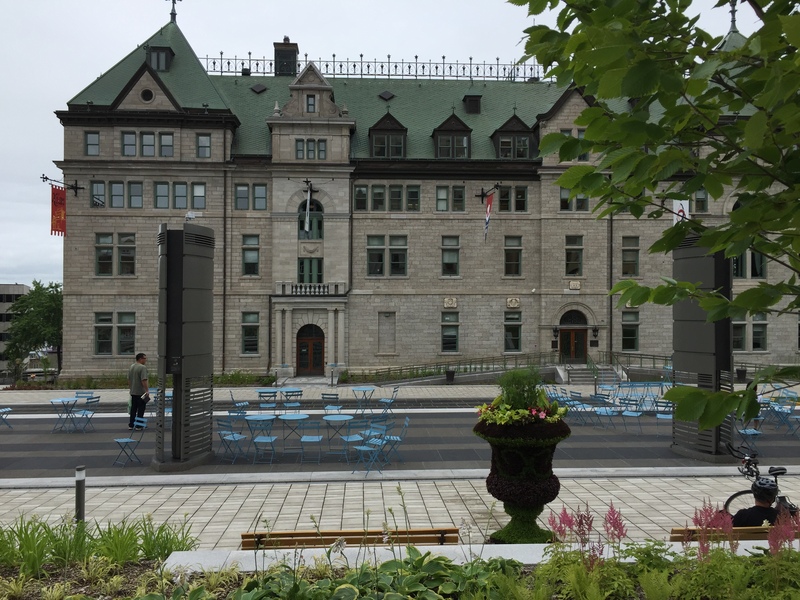 This plaza was created in front of the Quebec City city hall. It was actually very busy with people, I just caught a picture when it was empty. 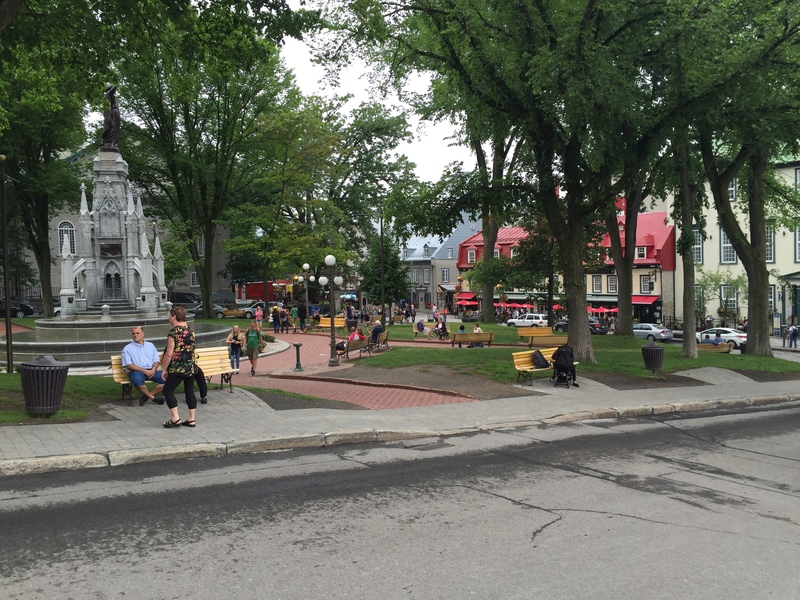 Plaza with chairs and tables in front of city hall, Quebec City. 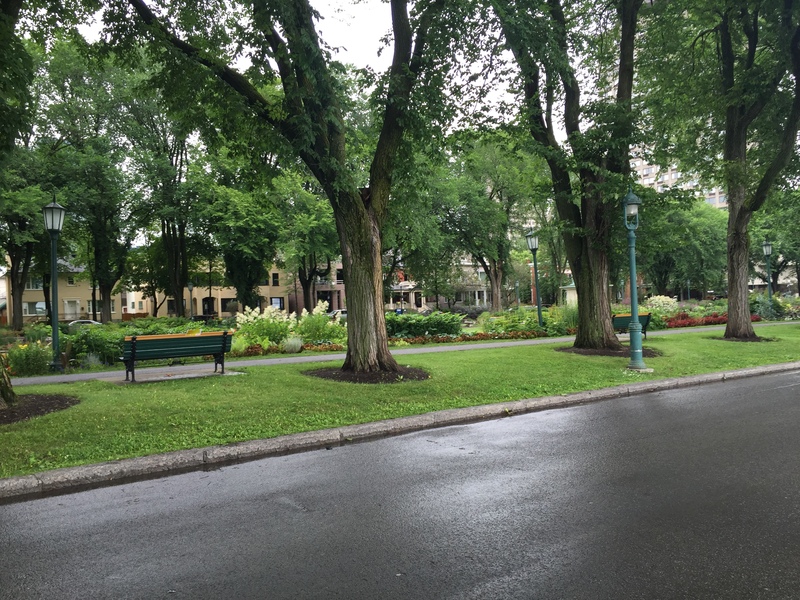 Lush flower garden, Quebec City. 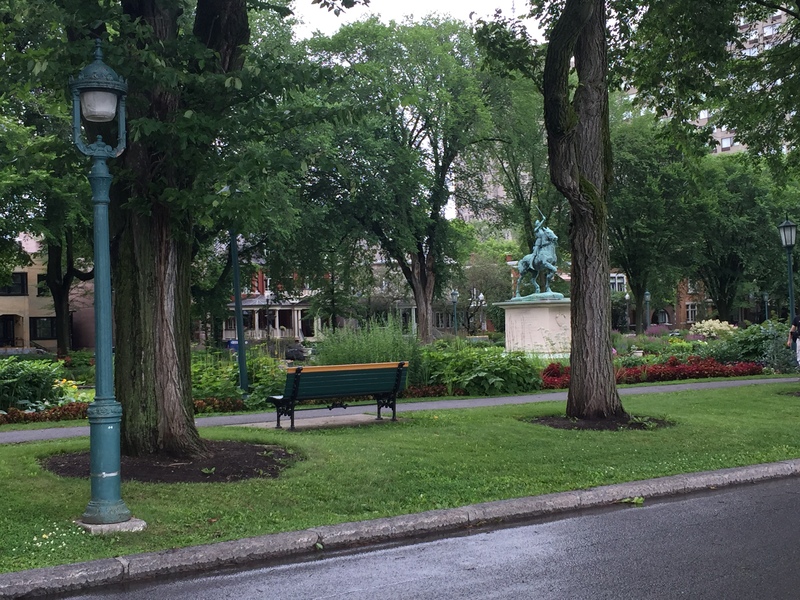 Lush garden with statue, Quebec City. 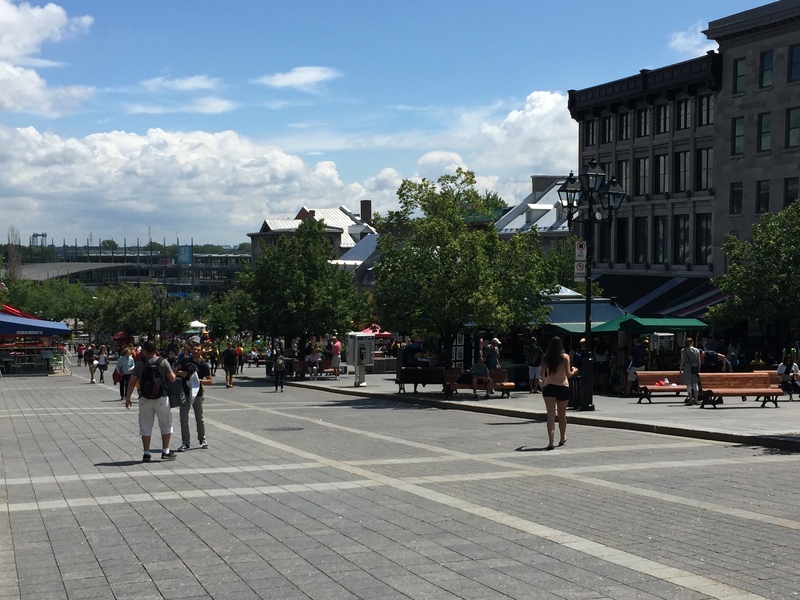 Plaza Jarques-Cartier is closed to vehicles throughout the summer. Artists bring their kiosks to sell their art, or to paint caricatures, or landscapes. 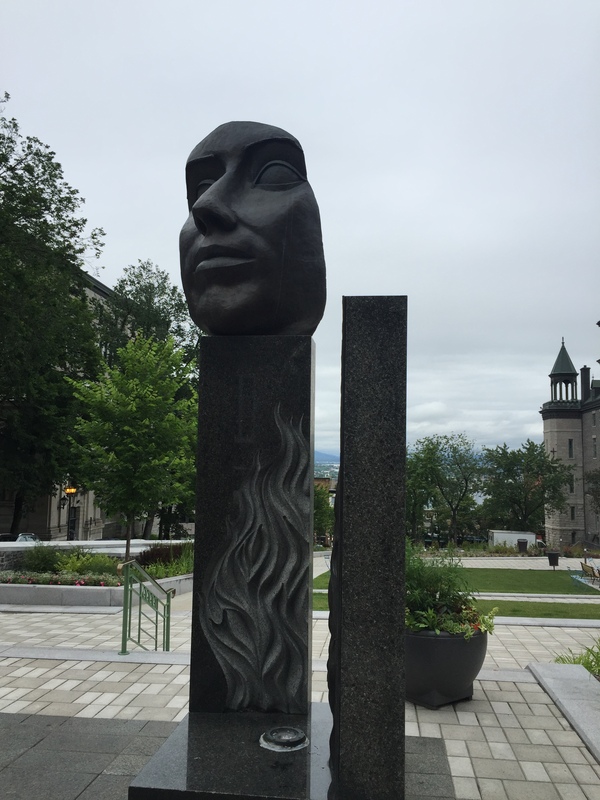 This is adjacent to the Montreal City Hall with the flower public art. Restaurants line the square allowing for tourists to people watch and take in the views. Place Jarques-Cartier, closed to cars in the summer, Old Port, Montreal. 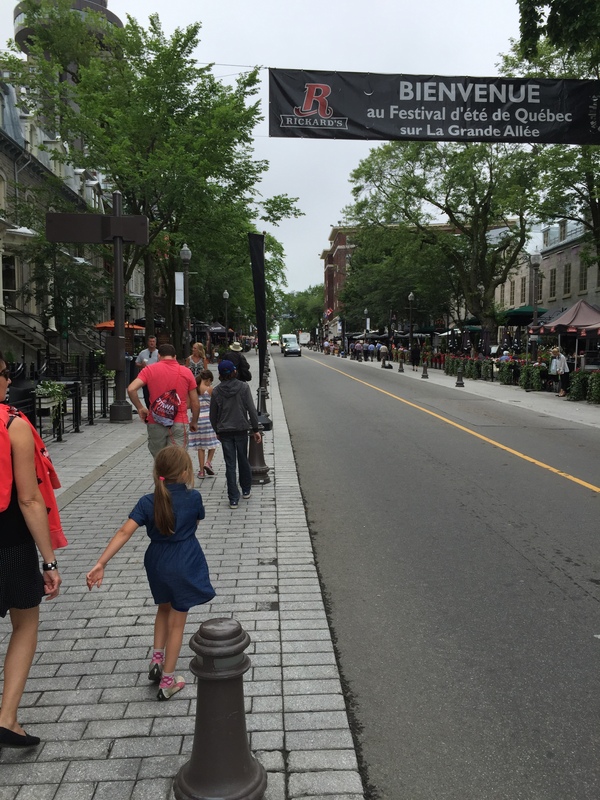 These sidewalks in Quebec City were extended exclusively for the summer, to allow for more space for outdoor dining, while still leaving space for pedestrians to walk by. In the winter the bollards are removed for vehicular traffic. 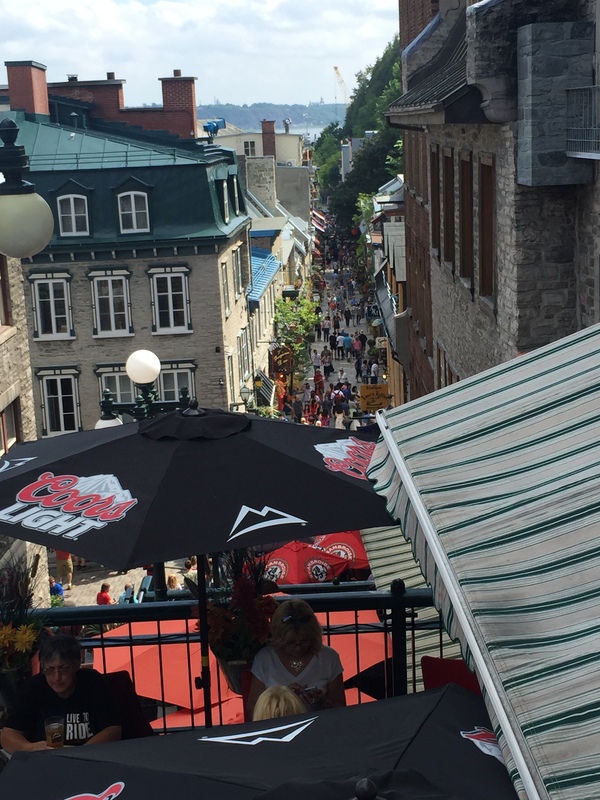 Sidewalk was widened to accommodate more terraces, Quebec City. 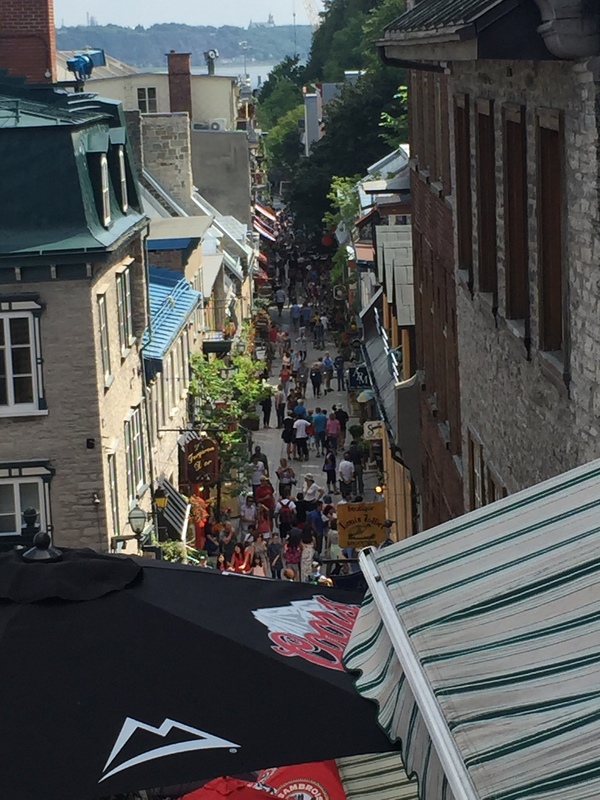 One of the oldest streets in Quebec City is a small paseo with shops and restaurants. Tourists flock here for the European architecture, and walkability. 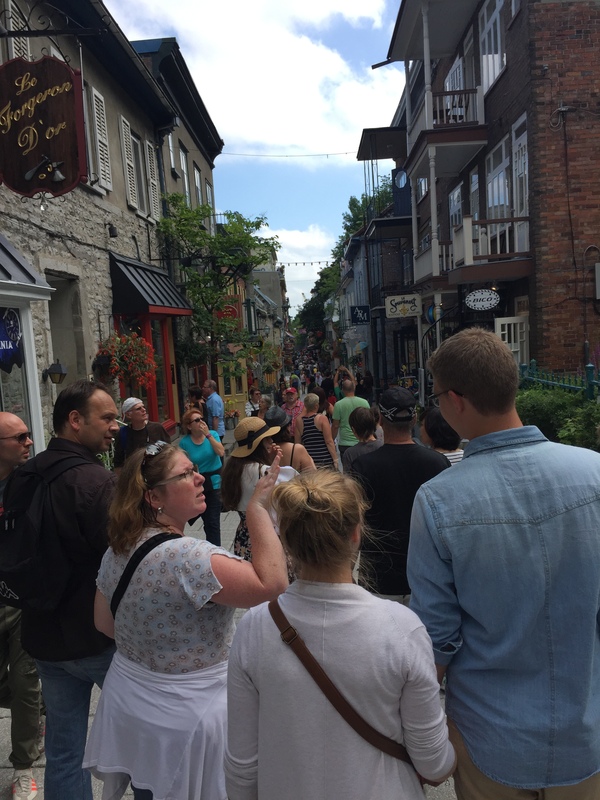 Small walking paseo, old Quebec City. Sometime the simplest additions are the best. 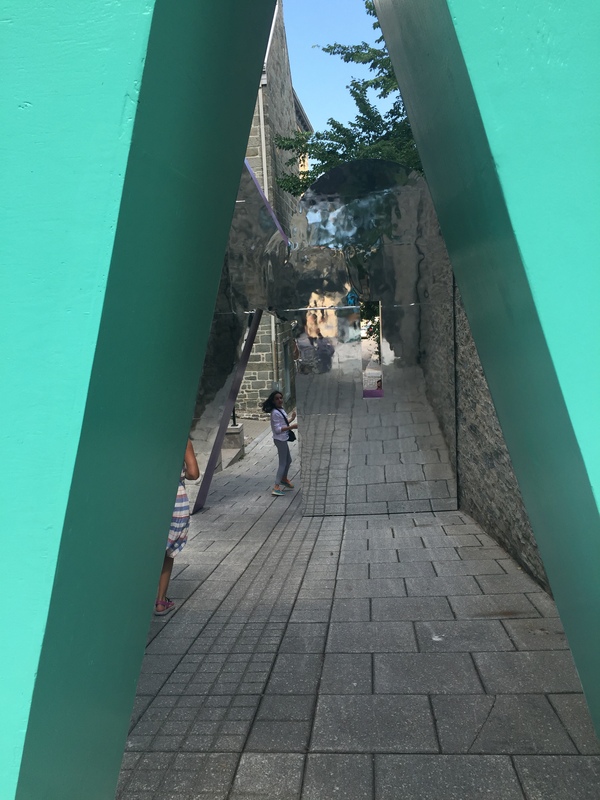 Here “balloons” add color to a pedestrian plaza in the oldest part of Quebec City. The trees add great contrast color and much needed shade for sitting and relaxing for a moment. Simple colorful balloon shaped ornaments in trees of plaza, Quebec City. First, parklets. These outdoor extensions are essential for modern day businesses and vibrant urban streetscapes. San Jose has nearly 12 months of perfect weather for these outdoor dining spaces and the opportunity is primed on San Fernando Street to become a parklet corridor. Currently, Chacho’s is the only business with a parklet. But if parklets were added to the diner moving in next door, the M Lounge, NextSpace, and Hanuman, the rhythm of the street would being to take shape. Second, murals. 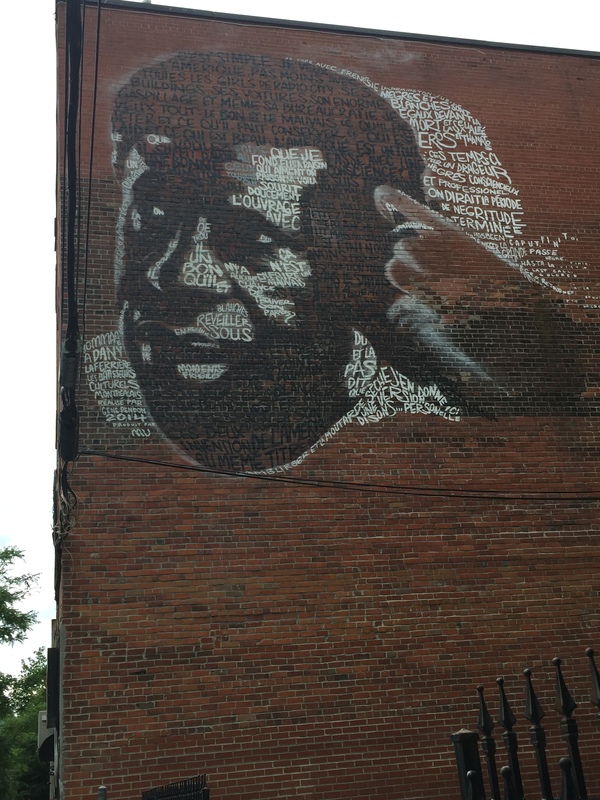 Murals add color, voice, and character to a neighborhood. With the SoFA district murals adorning many of the walls, with new murals up from the subZero festival and The Exhibition District in downtown, and with Empire 7 studios doing murals in Japantown, San Jose is ripe for a mural revolution. 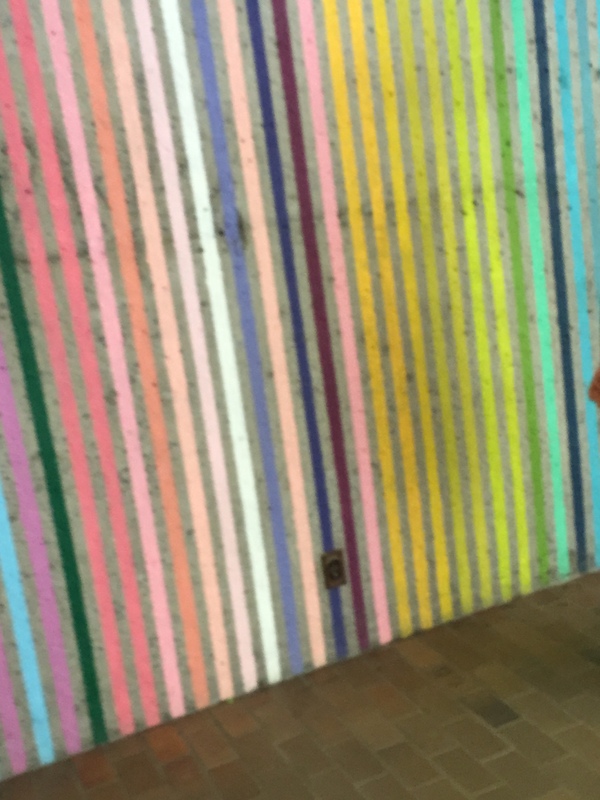 Whether big or small, the unexpected, even provocative nature of murals are essential for San Jose’s artistic culture to continue its growth, its evolution. Third, public art. San Jose public art has long been mired down and associated with a pile of poop statue, and an ugly red mural on the front of the convention center. The only way to change this is not by taking these infamous pieces down, but by adding countless new, better quality public art pieces, everywhere. Public spaces, private courtyards, building lobbies, even parking lots. These places are void of public art, it’s time to fill them. Fourth, public spaces. The public spaces and plazas in downtown are vastly under utilized. Most are cement areas without shade, seating, or color(flowers maybe?). It doesn’t take much to activate these spaces like the Circle of Palms, or City Hall Plaza. Shade, food/drink, art kiosks, and other vendors easily bring interest to otherwise sun drenched deserts. The positive is that these plaza are already walkable, now they need to become relaxable, appealing. Fifth, pedestrian/bike friendly. Cycle tracks are a fantastic tool to safely move bicyclists of all ages and abilities throughout a city. Cycle tracks are separated by a small cement barrier, allowing bicyclists to ride in both directions(even on a one way street) without impeding pedestrian traffic on sidewalks or vehicle lanes. Cycle tracks could easily be applied on 3rd, 4th, 10th and 11th streets. These streets have already been designated as bike corridors, so putting in cycle tracks is the next logical step in promoting and encouraging biking for everyone. The last take-a-way is not a tangible thing, it is a mentality. 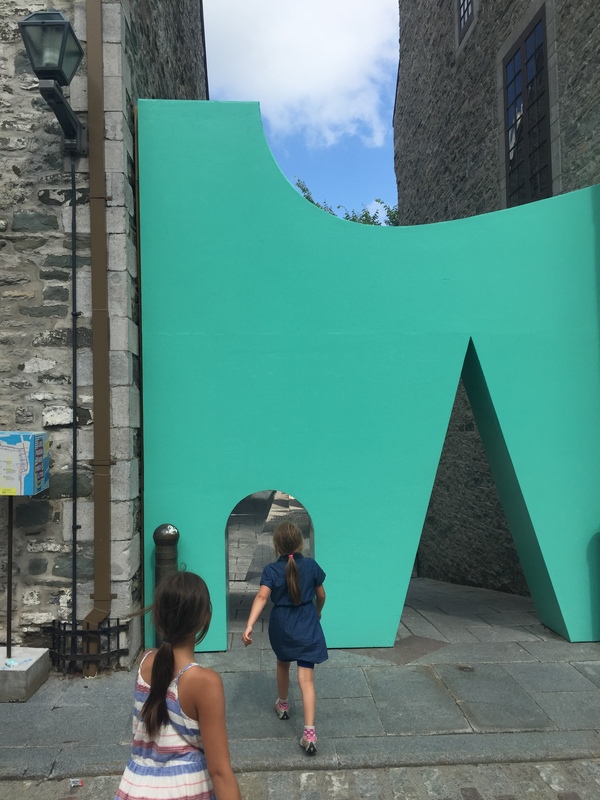 The previous five ideas are the physical results of a greater idea, a passion, an understanding that life for Quebecois is joyful, complex, unexpected, refined, interesting, and ultimately should be fun. The culmination of this attitude, this mentality, is represented in the physical space they inhabit, work and play in. 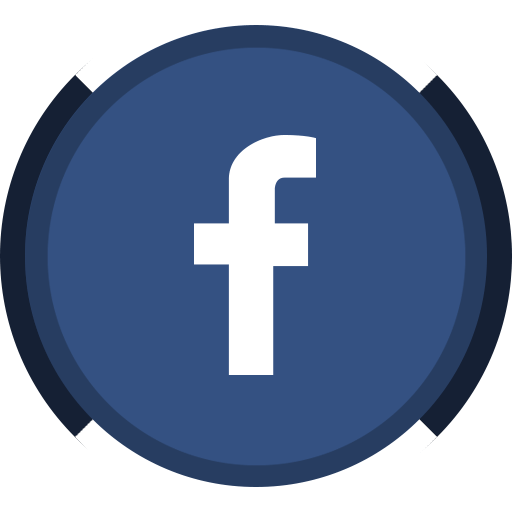 If it this true that the physical environment that surrounds us is the representation of our lives, does San Jose’s environment represent you? If it does, keep doing what you’re doing. If it doesn’t, change it. Make your life more beautiful, live with more passion, enjoy the good, and make the best of the bad. No more excuses, we have it all in San Jose, we just need to start doing. Thank God, San Jose already has more attractive downtown than Montreal’s downtown. 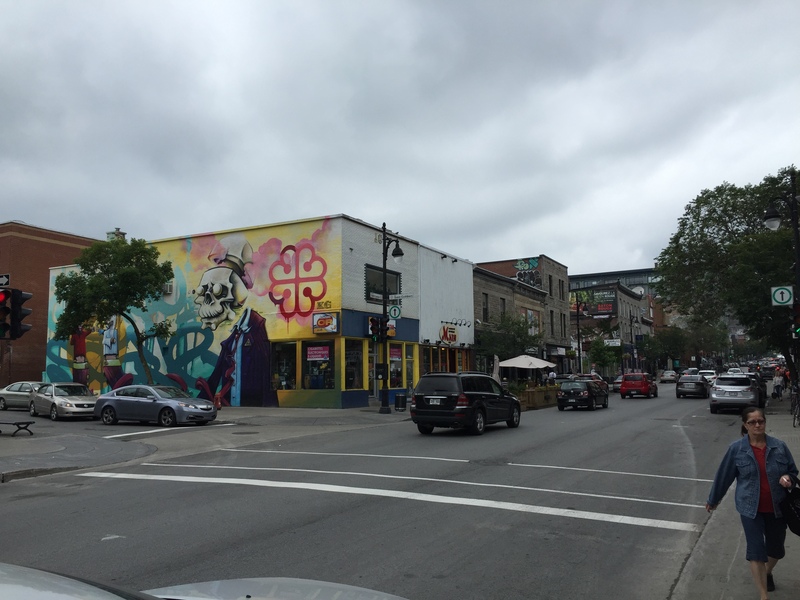 Downtown Montreal is older, grittier, and dirtier with less pedestrian malls, think First St. transit mall and Paseo De San Antonio in San Jose. They just recently underwent a construction boom in Dt. Montreal for the last 7 years. It’s great that Downtown Montreal is back alive again after being kind of weak and dead in the 90’s while San Jose was going strong back then. What makes Downtown SJ better-lots of pedestrian malls, being cleaner, having a real beautiful public building like city hall and Martin Luther King Library and pretty private towers like Axis and One South Market. The new SoFa Market is adding some kick to SoFA district. Downtown San Jose, despite not being a major retail center due to Valley Fair and Santana Row so close by, is still ahead of Downtown Montreal in redevelopment progress by 5 years. I do think the city could do more to get use out of its outdoor spaces, like Paseo de San Antonio, the Circle of Palms, City Hall Plaza and some parklet areas, there was an expansion for SoFA market recently though. I do think they would have to rent out the spaces like those to coffee carts, food carts, or trucks in order to get more use out of them tbh. I do agree that the city could do more to improve bike lanes, like moving the parking to the other side of the bike lanes, making them protected bike lanes. Also adding more bike lanes going east since San Fernando ends. It would be good for bike lanes to go 2 miles from downtown, since 2 miles is about the distance that is easily bikeable. 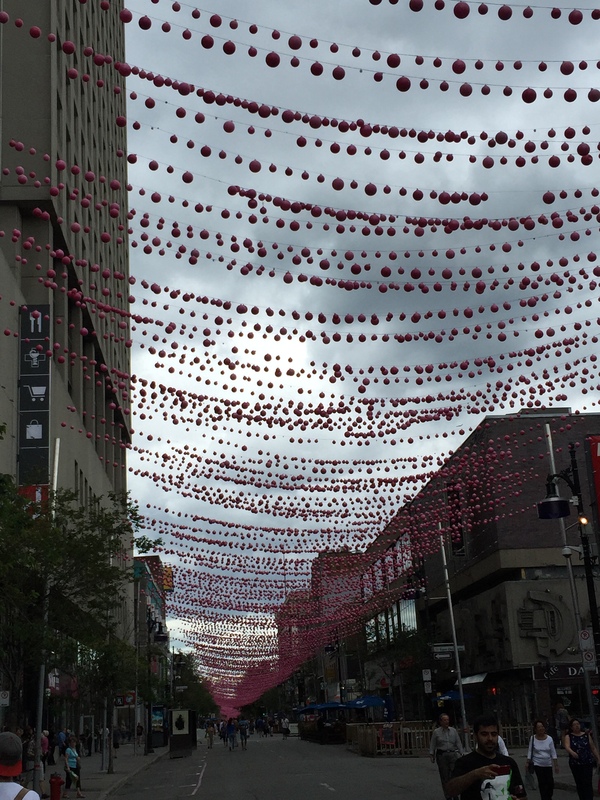 Not a big error, but for your information, Sainte-Catherine, the Gay Village street with the pink ball installation, is actually closed to cars for 4 months, end of April to September 7. Thanks Guillame. I will update that. 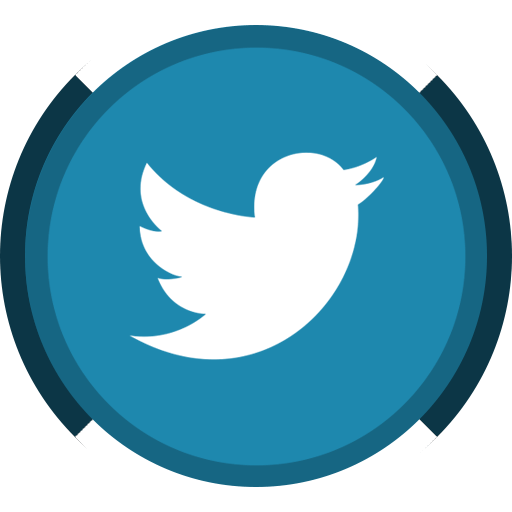 Would love to see San Jose take a page or of other city’s successes. 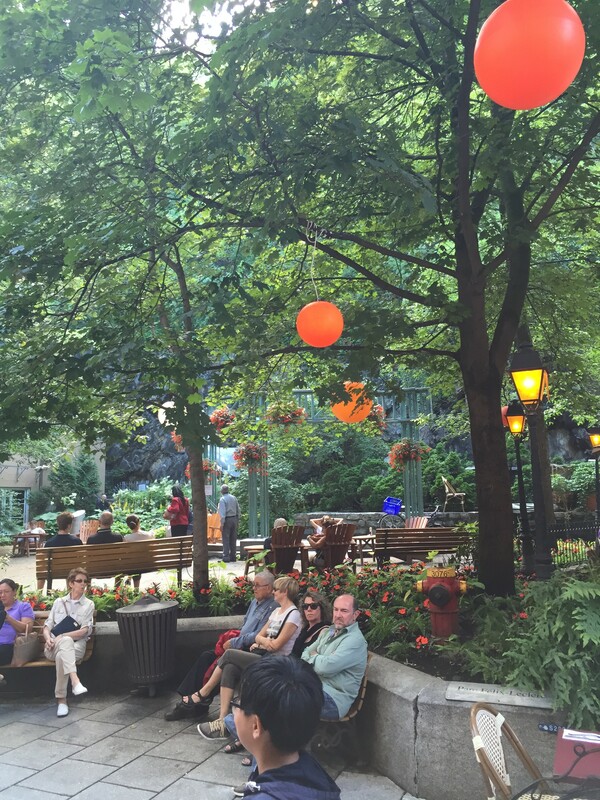 How about how NYC transformed Bryasnt Park? Or the wonderful sidewalk cafes and murals in Melbourne? These cities didn’t start with their great aspects, it took citizen and city government to take risks to turn their cities into major urban areas that attract people to live, work, shop and visit. SJ had such great potential, sure hope it can live up to it!